According to those estimated franchise values at Forbes, the San Diego Padres are in the bottom half of baseball’s 30 organizations. Perhaps even more relevant, the Padres are routinely among baseball’s bottom ten spenders. The Padres have pretty much never behaved like a big-market team, and after long enough, that creates a pretty rigid impression. One thinks of the Padres the way one might think of, say, the Reds. When it comes to high-profile free agents, you feel comfortable ruling them out. Why would you think the Padres would be a player? Of course, teams can choose to change. And as much as we might still think of free agency as directing players toward certain big spenders, you never know when someone might surprise you. One offseason ago, the biggest free-agent contract went to Eric Hosmer, and it was given by the Padres. And now this offseason, the biggest free-agent contract so far is going to Manny Machado, and it’s being given by the Padres. According to reports, the deal will be worth $300 million over ten years, with an opt-out after year five. It’s close enough to the contract we’ve always expected. I just don’t think anyone really expected the team. The Padres read the market, and they chose to be aggressive, where other clubs were more cautious. Now the door could be open a year ahead of schedule. The Padres say they plan to supplement a young core of homegrown prospects with a handful of more costly veteran players. They will add those players, they say, when they believe those additions can make up the difference between what they are now and what they hope to be. No, nothing there is formally ruled out, and you also have to consider the possibility the Padres might’ve been intentionally keeping things quiet. But things can stay only so quiet when you’re dealing with a high-profile free agent and a high-profile regular agent. Early on, I doubt the Padres thought they had a real chance to sign Machado. 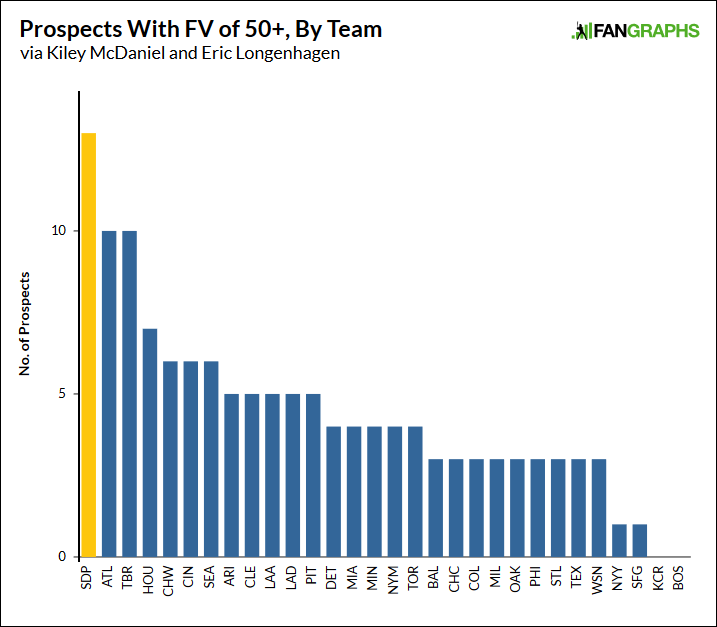 Even though everyone knew they needed a third baseman, they were connected to lower-profile free agents, and trade possibilities. And then the weeks just kept on going by. The Yankees kept downplaying their level of interest. The Dodgers didn’t signal their intent to engage. A number of big-budget teams didn’t appear meaningfully interested in Bryce Harper, limiting his pool, and therefore also limiting Machado’s pool as a consequence. Teams all have their own reasons for making the decisions they do, but when big spenders stay away from the biggest free agents, it doesn’t mean those free agents don’t get jobs. It means those free agents become more available to more unlikely contenders. Machado didn’t exactly fall in the Padres’ lap — this is still a $300-million commitment. Unadjusted for inflation, it’s the biggest free-agent contract in the history of North American sports. But the Padres saw that Machado was truly, actually gettable. They could be the team to offer the $300 million. Weird things can happen in free agency when said free agency drags on for a number of months. Machado’s slow market is presumably what pulled the Padres in, and now they’re the winner of the sweepstakes. It’s undoubtedly a shock, given the Padres’ spending history, and given their 66-96 record. And yet, look at it another way, and this is an excellent fit. Maybe even an obvious fit. Machado and the Padres should go perfectly together. The Padres needed a short-term third baseman. They also needed a long-term third baseman. The only team projected worse at third base was the Royals. Machado will probably play third now, with Fernando Tatis Jr. close to settling in at short, and with Luis Urias close to settling in at second. Machado is a premium third baseman, and he is just 26 years old. It takes a while for Machado to turn, and we’re looking at a ten-year total of 38.8 WAR. According to Szymborski’s calculations, Machado should end up worth more than $300 million. I will point out that I came up with my own numbers. I looked for players since 1950 who were comparable to Machado between the ages of 22 and 25. Those same players, between the ages of 26 and 35, were worth an average of 29.3 WAR, with a 30.1-WAR median. That’s worse, but still good — that’s a decade of comfortably above-average performance. Baseball, of course, has changed, and aging curves have changed, and every single player is unique. But great players tend to stay good for a while. Manny Machado is a great player. The Padres are in first place, three players ahead of the Braves and Rays. Yes, prospect evaluation is subjective, but the Padres’ farm draws rave reviews across the board. It is possibly or probably the best farm system in baseball, topped by Tatis, and this doesn’t even count good young players already in the majors, like Franmil Reyes or Joey Lucchesi. As a general rule, some prospects bust, but as another general rule, the more good prospects you have, the more you can expect to work out. Talent is coming. It’s already begun to arrive. Machado is parachuting in as a star player, for the rest of the Padres to build around. Before, the Padres might’ve been eyeing 2020 or 2021. With Machado, they might still be eyeing 2020 or 2021, but now the odds of contention in 2019 are improved. They wouldn’t be the first rebuilding team to arrive a year ahead of time. Not that you can always talk yourself into that, because rebuilds aren’t always smooth and predictable, but the Padres do appear to be in increasingly good shape. It’s just going to end up a question of their future budgets. Here’s why the Padres see Machado as a fit: He’s great, he’s young, and they have a strong farm system. The whole reason why good, young, club-controlled players are so valuable is because they perform at a high level while costing hardly anything. The Padres figure Tatis will be good, and it’ll be a while before he’s truly expensive. With so many young players in place or on the way, the Padres are confident they’ll get a lot of production for pennies on the dollar. That gives a team the flexibility to make major investments elsewhere. The Padres believe they can afford Machado because so many other players will be underpaid for the next several seasons. The one tricky thing is that Machado’s contract doesn’t exist in isolation. It exists alongside Eric Hosmer’s $144-million contract. It also exists alongside Wil Myers‘ $83-million contract. Machado is going to make $30 million per season. Hosmer makes $21 million each year until 2023. Myers is a year away from costing $22.5 million. In 2020, 2021, and 2022, Hosmer, Myers, and Machado will make more than $70 million combined. Just a couple seasons ago, the Padres’ opening-day payroll was about $70 million, total. You can see how things might end up getting tight. The Padres will get a steady infusion of young talent, but good young talent becomes increasingly expensive, and the Padres already have a large three-player commitment. It’s relatively uncommon to see such giant contracts on smaller spenders. One might be reminded of Joey Votto‘s contract with the Reds. Or Giancarlo Stanton‘s contract with the Marlins, or Joe Mauer’s contract with the Twins. There exists the distinct possibility that, in the future, the Padres won’t be so flexible to make other necessary improvements. It’ll be up to ownership to prove it’s willing to invest what it has to. I’d consider it a good sign they were willing to make a strong play for Machado in the first place. I’d also imagine the Padres have become increasingly desperate to send Myers to somebody else. It would help the team’s future, presumably, to remove him from the books, and he’s still young enough to hold certain appeal. Long story short: In a winter of under-enthusiastic spending, the San Diego Padres, of all teams, are signing one of the best young free agents in baseball history. It is not a move without enormous risk, because the Padres can’t afford as many mistakes as a bigger-revenue organization. They already regret the decisions they made with Hosmer and Myers. Furthermore, Machado has long posted a rather dramatic home/road split, and there are more than a few concerns regarding his character. That being said, Machado to this point has been sufficiently driven to become one of the best players in the world. That doesn’t happen without obsessive dedication. The Padres believe in the track record. They believe in the track record, and they believe in their own future. The Padres were already planning to nudge the Dodgers sometime around 2020. Now they’ve got the Dodgers’ attention a dozen months early. Doesn’t mean they’re a first-place team. They are presumably not yet a first-place team. But they’re a more dangerous team, with reinforcements coming. I’m not sure what Harper’s going to decide now, but it shouldn’t be long, and, regardless, the National League is going to be nuts. We hoped you liked reading The Padres Are Actually Signing Manny Machado by Jeff Sullivan! When I saw this signing pop up on MLBTR, I literally said “What the f*ck” out loud with no context. I think our former editor actually blinked when he knew his team snagged Machado. I’d like to imagine that Dave spent the whole season begging them to be in on Machado and they only finally needed his case and suggestion this week. And Dave wept in relief. Brad Lidge also wept in relief once..